Discover the exciting facts about the erstwhile Bandra. Delve into the history of this glamorous city and listen to stories that will make you fall in love with it. 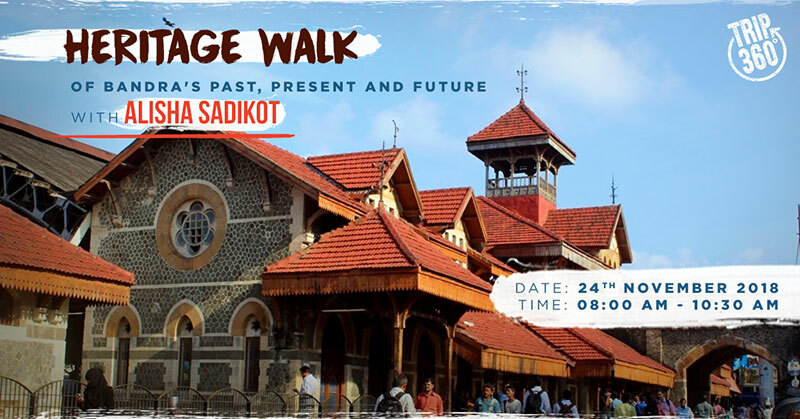 Kindly find below the details on the Heritage Walk. Join us at Trip 360 as we explore the unique physical spaces, character and cultures of contemporary Bandra; it spotlights the neighbourhood’s particular history and legacies, and attempts by its communities to preserve and negotiate the same today, at a time of monumental change and loss in t he city. The walk begins at Land’s End, the south-western tip of Bandra. We visit the remains of the 17th century Portuguese Castella de Aguada, popularly known as the Bandra Fort, and its immediate surroundings. At the Land’s End, a busy, public garden maintained by the local resident’s trust is illustrative of how thoughtful conservation can critically benefit communities. Leaving the Land’ End, we climb up Mount Mary Hill to explore the history, architecture and popular traditions of Mount Mary Church, a Bandra institution. St. Stephen’s Church, a few metres away, stands in sharp contrast to Mount Mary, as intimate and private, as the latter is monumental and public (St. Stephen’s Church is an exterior visit only). Finally, in Ranwar village, one of Bandra’s few surviving East Indian village communities, we discover remnants of a fast disappearing way of life. Post the walk, you can also join us for breakfast at a heritage eatery!